Codling Moth (CM) -- 1st generation, first sustained trap catch biofix date: May 18, Wednesday. Codling moth development as of June 8: 1st generation adult emergence at 70% and 1st generation egg hatch at 16%. In most orchards, insecticide targetted against plum curculio and apple maggot prevent codling moth damage. If targetted codling moth control is needed, key management dates are: 1st generation 3% CM egg hatch: June 3, Friday = target date for first spray where multiple sprays needed to control 1st generation CM. 1st generation 20% CM egg hatch: June 11, Saturday = target date where one spray needed to control 1st generation CM. Obliquebanded Leafroller (OBLR) -- 1st generation OBLR flight begins around; June 4, Saturday. Where waiting to sample late instar OBLR larvae is not an option (i.e., where OBLR is known to be a problem, and will be managed with an insecticide against young larvae): Early egg hatch and optimum date for initial application of B.t, Delegate, Proclaim, Intrepic, Rimon, Altacor, Belt, pyrethroid or other insecticide effective against OBLR (with follow-up applications as needed): June 21, Tuesday. Oriental Fruit Moth OFM -- 1st generation OFM flight starts: April 23, Saturday. 1st generation 55% egg hatch and first treatment date, if needed: May 27, Friday. 2nd generation OFM flight begins around: June 27, Monday. Plum Curculio (PC) -- Increased risk of PC damage as McIntosh and similar varieties increase fruit size: May 22, Sunday. Earliest safe date for last PC insecticide spray: May 24, Tuesday. If relying on repellance by Surround instead of PC mortality by insecticide, Surround coverage should be maintained until PC egglaying begins to naturally decline around Saturday, June 25. Spotted Tentiform Leafminer STLM -- 2nd STLM flight begins around: June 14, Tuesday. Rough guess of when 2nd generation sap-feeding mines begin showing: July 4, Monday. We're in a bit of a lull, the most common questions being do I need to spray a fungicide (most likely no) and/or an insecticide (most likely, yes). Primary scab season is pretty much over, continue to scout of scab lesions, if you don't see any, you are all set. If you do see some, well, back on the sprayer with Captan when it rains. Plum curculio seems to be a bit of a bugaboo this season, with more damage being seen than usual. I think they hit early and hard, and you have to wonder if the lack of lots of fruit makes the remaining fruit more attractive and/or more likcly to see the damage? Anyways, there is still risk of lingering PC activity, but if you had good insecticide coverage on through the past few weeks you should be done. BUT, now is the time to worry about leps, including Oriental fruit moth, codling moth, and obliquebanded leafroller. Timing for effective insecticide applications (of Alatacor, Delegate, or similar) is coming up in the next couple weeks. Orchards vary widely in susceptibility to these pests, so you be the judge for need to treat. Please read guest article for more information. I find trees that still need pruning and training (stripping of leaders). June is the month to get this done, ASAP! Enjoy what appears to be a fairly nice stretch of weather to get things done. Observations: Many adults’ flying/crawling in and about new shoots. A small number of nymphs observed, all but one appeared dead. Recommendations: Recommend putting a horticultural oil application down now to interfere with egg laying of the adults we saw today. In mid-June, go through block with horticultural (not dormant) oil and any one of the following (specifically excluding Agri-Mek as a 21 day application interval restriction is in place): Actara (4A), Centaur (16), Delegate (5), Esteem (7C, most effective against egg & early instar nymphs), Portal (21A). These materials are all listed as having low to moderate toxicity to beneficials. Think about Surround. There is no concern about resistance and no harmful impact on beneficials. Cultural recommendations: Remove water sprouts late June-early July to reduce feeding sites for next generation psylla. Use only the minimum requirements of nitrogen and avoid hard pruning, this is intended to reduce excessive vegetative growth, again, reducing feeding sites. Observations: Surrounding woods and hedgerows have a large number of wild hosts. Looking at the weather, relative humidity has been high in the area, a contributing factor for infection. Last spray was May 27, Penncozeb (3#/A, scab), Captan (1qt/A, scab) and Imidan (2#/A). Recommendations: Last fungicide application should keep you covered until next week at which point an application of Captan + Topsin M should begin cover sprays for sooty blotch/flyspeck. Observations: In row weed control looks good, for the most part. Keep on it! Bindweed looks like it is trying to creep back in. Recommendations: Between row mowing should be kept up through the summer to reduce weed seed banks for spring. With the non-porous tree guards still on the youngest trees, you can use glyphosate (Roundup or generic equivalent) to knock that pesky bind weed (now is a good time to treat the nutsedge we saw today too) back, just remember to be REALLY careful not to get it on your trees. Be sure to look out for root suckers too. Use Alion (3rd-leaf and older) or Matrix (1st-leaf and older) for pre-emergent weed control. Notes: As we discussed today, keeping on top of your weeds will make your life easier when it comes to managing voles, borers and other pests as well. Removing weed flowers through mowing will also reduce the likelihood of exposing foraging bees to future insecticide applications. 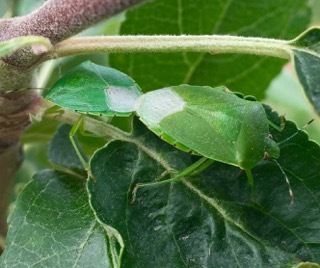 Observations: Found a mated pair of green stink bug (Acrosternum hilare). 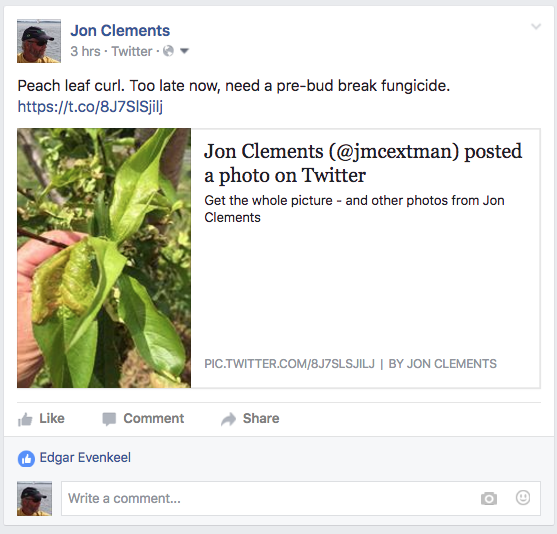 Recommendations: No real history of stink bug damage in the orchard. Keep an eye out, but no pesticide application recommended at this time. Notes: Will continue to scout for stink bug but this particular insect is not usually of concern in orchards in the area. Plum curculio: considering the odd year we have had with this pest, a border spray might be a good idea. Apple maggot: not yet, we will revisit this one in late June. Lepidopteran complex: as I said earlier today, you have no history of damage from codling moth, oriental fruit moth or oblique banded leaf roller and the insecticide sprays you use to manage plum curculio and apple maggot should also clean up these moths. But, if a concern, recommend application of Alatacor or Delegate in next couple of weeks. No particular HF disease issues this week...although we have heard rumors of fire blight strikes showing up in the upper Hudson/lower Champlain Valley of NY. Keep the watch up, let us know if you suspect any fire blight in your orchard. Reprinted from Scaffolds Fruit Journal. Vol. 25, No. 12. June 6, 2016. We're entering the prime window for control of our most serious fruit-feeding lepidopteran pests – oriental fruit moth, codling moth, and obliquebanded leafroller. Oriental fruit moth adults are finishing up the first flight of the season, and the first flush of OFM larvae, which aren't a major threat to newly set apples and would have been best handled during the petal fall period, are mostly on their way to pupating. In contrast, codling moth adults have been flying for at least a couple of weeks around the state, and the eggs they have laid are in the early stages of hatching, which makes this week a very opportune time to apply the first control sprays against the early- instar larvae. Fortunately, we have a good selection of effective materials to use against them. The best products for controlling both CM and OFM are those in IRAC Group 28 (containing a diamide; i.e., Altacor, Belt, Exirel, Voliam Flexi or Voliam Xpress) or IRAC Group 5 (mainly spinetoram, Delegate; spinosad, formulated as Entrust, is an organically approved option). Two applications from either of these groups on a 10–14-day interval would be recommended starting at 220 DD50 from biofix; we're already slightly past this point in Geneva and Highland, but most of WNY and the Champlain Valley is probably just entering the zone. Products with insect growth regulator activity, such as Rimon or Intrepid, would have been better advised last week. Other products with activity against internal leps include the neonic Assail and, in orchards where resistance has not developed to the newer pyrethroids, also Baythroid, Danitol, Endigo, and Leverage. Most older broad-spectrum materials like Imidan, Lannate, and the older pyrethroids, which were formerly more effective, are generally not good choices because of insecticide resistance issues. Now would also be an appropriate time for an application of a granulosis virus product such as Cyd-X, Madex or Carpovirusine, in additon to the larvicides discussed above. These are biological insecticides, which must be ingested to initiate the infection, after which the virus replicates inside the larva until it is killed; this releases more virus particles into the orchard. This is a very useful approach for longterm population reduction, particularly when used in at least 2 applications per generation. Madex contains an isolate that is also effective against OFM. OBLR larval emergence is still on the order of 7-10 days away in Geneva, but should just be starting in the Hudson Valley. Anytime from first hatch until about 25% hatch (360-450 DD43 after biofix) would be an appropriate time for a larvicidal material, and the IRAC Group 5 and 28 products recommended against CM and OFM will also be very effective against OBLR. Others with slightly less efficacy, but useful in lower pressure situations, include B.t. products (Biobit, Dipel, Javelin, MVP, etc. ), Proclaim, and possibly Intrepid. In orchards where OBLR pressure is unpredictable, we recommend waiting until approximately 600 DD43 and sampling for infested terminals using a 3% threshold (see p. 71 in the Recommends). More details on the nuts and bolts theory and practice of CM and OFM management can be found in the fact sheet by Breth, Agnello and Tee at: http://www.fruit.cornell.edu/lof/ipm/ pdfs/codling_moth.pdf. We should soon be seeing the emergence of crawlers of San Jose scale (SJS), Quadraspidiotus perniciosus (Comstock) from under the overwintered adult female scale covers on apple trees. The SJS has become a primary fruit pest in many orchards across the region over the past 10 years, as older chemistries such as Penncap-M and Lorsban, which once held this insect in check, have been removed from the pest management toolbox. 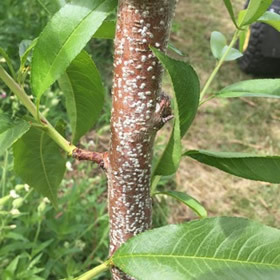 With little in the way of residual insecticide in the orchard after the threat of plum curculio has passed, there is little to keep this insect from gaining a foothold in tree fruit blocks, which invariably leads to severe economic injury if left unmanaged. Many producers find this insect very difficult to eradicate. Multiple applications targeting all (up to three) generations using products with different modes of action appear to work best. The pheromone-based model we now use focuses on the adult flight as a biofix, predicting SJS crawler emergence at 310–400 DD (base 50°F). This year, the first adults were observed in traps on May 16 in Highland, and May 26 in Geneva; we've accumulated 355 and 221 DD, respectively, to date. Therefore, the onset of crawler emergence is imminent. We are quite fortunate to have a number of effective insecticides to assist us in managing this insect during key timing windows of the growing season. The window of opportunity for using materials such as Lorsban and Supracide for this generation has passed. Our options now include contact insecticides or insect growth regulators that will target the emerging crawlers. Centaur 0.7WDG, an insect growth regulator (IGR; IRAC Class 16), acts to inhibit the synthesis of chitin. Esteem 35WP, also an IGR (Class 7), functions as a juvenile hormone mimic, inhibiting metamorphosis from one stage to another. Movento 240SC (lipid biosynthesis inhibitor; IRAC Class 23) is also effective when applied preventively, as its systemic activity requires some time for it to become established most effective when directed against the first appearance of crawlers, yet have no contact toxicity and tend to act very slowly. Assail and Admire Pro (Class 4) are both broad-spectrum neonicotinoids that can be effective when directed against emerging crawlers. The efficacy of some of these materials (e.g., Movento, Assail, Centaur) is improved by the addition of an adjuvant with penetrating properties; however, Esteem and Admire Pro can be used effectively without the use of a penetrant. Remember, rotating classes of insecticides for each generation will delay the onset of resistance. Making multiple applications of the same class or same insecticide at a 14-day interval for the same generation is recommended. Also bear in mind that we have been seeing another scale species, white Prunicola scale (Pseudaulacaspis pentagona), which affects stone fruits as well as apples, and appears as an infestation of numerous white scales that cluster on the trunk and scaffolds, giving them a whitewashed appearance (see Scaffolds No.2, March 28, 2016). Feeding reduces tree vigor, and foliage of affected trees may become sparse and yellow; heavy infestations can cause death of twigs, branches and entire trees if left unattended. This species overwinters as an adult female and deposits eggs in the spring. The same insecticides as for SJS can be used against crawlers in mid-June through early July (about 700–1150 DD base 50°F from March 1). We are currently at about 535 DD in Geneva; 596 is predicted for June 11, so the window for application against this pest should coincide very well with a San Jose scale timing. The next Healthy Fruit will be published on Tuesday, June 14 (or thereabouts), 2016. As always feel free to get in touch with any member of the UMass Fruit Team (http://extension.umass.edu/fruitadvisor/team-members) if you have questions or comments.